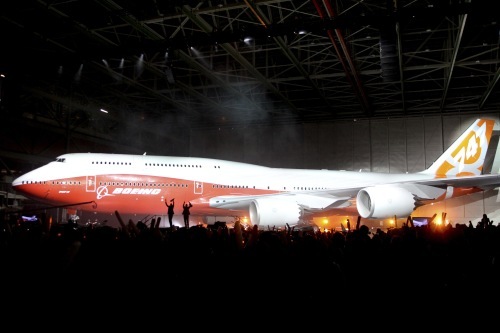 The curtain falls, revealing Boeing's new 747-8 Intercontinental on Sunday, Feb. 13, 2011 during the unveiling ceremony for the new airplane at the Boeing plant in Everett, Wash. The airplane is the largest passenger plane built by Boeing. It will be assembled at the Boeing plant in Everett. (Photo: AP-Yonhap).